"This Joint Memorial establishes an ever present need for local input as it relates to Highway Safety, Highway Improvements, and Human/Wildlife Interactions. It also expresses the need for all Stakeholders to be involved in the NEPA process as it relates to projects relying on public funding." It has been discovered that Y2Y has brought in their members and counterpart organizations again to contact the legislature in opposition to HJM 6. As done in the Targhee Pass Environmental Assessment (EA) comment periods, Y2Y contacted individuals from other states and Y2Y-Canada to support their wildlife overpass objectives by submitting comments during the EA comment period, it appears this tactic is currently being used with our legislators to oppose HJM 6. Y2Y opposes HJM 6 because they don't want local citizens, or local governments, to have involvement or control over what happens in their community. The Idaho Transportation Department (ITD) just released the much anticipated draft Environmental Assessment (EA) on Targhee Pass. Alternative 3, which does not include any wildlife overpasses, was chosen for the upgrade on US 20 from the Hwy 87/US 20 junction to the Montana line. Instead, multiple signage warnings, cut back of trees, and other methods will be used to increase the safety along that portion of the corridor. Here is a list of all documentation, along with technical and other reports used in the EA. However, everyone is highly encouraged to read this EA report. It explains the reasoning behind the decision, but also has hints of other intentions to expand the species protection in the area such as for bears and wolverines through the Idaho Fish & Game (IDFG) wildlife technical report. Island Park must continue to be on guard for an aggressive agenda for landscape scale agendas which is mentioned in the IDFG report, their agenda will not end here. Reprinted with permission from the Island Park News. This is in response to Tim Reynolds assessment, posted November 2 in the Post Register, regarding the community division in Island Park on the overpass issue, in which that particular part he is correct. However, his assessment as to the reason for that division is incorrect. Mr. Reynolds begins his comments with an insult to the community, suggesting support of overpasses is a “no-brainer”, implying that anyone who does not support his position for overpasses is…well without a brain. Perhaps he should consider that it is this type of attitude that is perpetuating his isolation from neighbors, and the hesitancy for others to engage in “thought-provoking” discussions. He provides a second affront by suggesting the inability for the other side to be “reasoned and reasonable”. But the other issue, and it is the primary issue, is the work that was conducted, starting many years ago, for the purposes of overpasses in Island Park. This work was hidden, and kept secret, from the Island Park community, starting with studies on Elk and Moose movement, clandestine meetings between the Idaho Transportation Department and Yellowstone to Yukon (Y2Y) partners, meetings between those same groups and Idaho Fish & Game, the promotion of overpasses by a Y2Y created group, Island Park Safe Wildlife Passage Initiative (IPSWPI), the summer before the Hwy 20 project was ever announced to the public, and Mr. Reynolds himself being actively engaged with Y2Y. While Mr. Reynolds chastises the Island Park community for not engaging in a robust dialogue on overpasses, he himself, engaged in discussions with groups who chose to keep the whole activity secret. What a natural set up for a “us-versus-them” situation. There was no appearance of his making attempts for “working together” with Island Park citizens at that time. Why was he not doing that from the beginning? Along the same tenor, how ironic he chose to publish his thoughts in a city 80 miles away from the community. This is the primary reason for the division. Mr. Reynolds correctly stated relationships have changed in Island Park. However, those relationships have always been built on trust, honesty, and respect. Island Park citizens are bonded to each other and have a fierce loyalty to Island Park, protecting and preserving it. Any person who works in secrecy, violating those principles, is not going to be accepted well, and there is nothing wrong with that. For that reason, it is his relationship with others that has changed. Fortunately, the citizens have done their homework, discovered discrepancies in data, studied documentation about Y2Y and their intent to pursue connectivity goals with overpasses, and how they have engaged with state agencies behind the scenes. Any unwillingness to address all of this by Mr. Reynolds only serves to perpetuate the hesitation to engage with him, and others who support overpasses. As yet, nothing has been written or spoken about these particular aspects of overpasses by those who seek to have them built. Mr. Reynolds, the next time you choose to write about community division and wanting more open dialogue, start with the truth. The “community ethic” for honesty and truth has not left Island Park Mr. Reynolds. It is still there, waiting for you to speak the truth. Which Truth is THE Truth? "Therefore, ITD and IDFG will initially focus on justifying, locating, and designing wildlife underpasses and overpasses, and fencing that provide for conserving wildlife linkage and crossing areas for big game. ◾️We will incorporate the highway crossing and linkage needs of Idaho’s species of greatest conservation need, including those species associated with wetlands, streams and rivers, and that are endemic or localized to unique habitats. ◾️In concert with right‐of‐way wildlife underpass and overpass design, mitigation and conservation strategies will include land protection adjacent to identified right‐of‐ ways important to wildlife linkage and crossings in order to protect habitats outside areas of ITD responsibility but necessary to maintain and protect the underpass and overpass investments made within the right‐of‐way. ◾️We will incorporate aquatic connectivity needs, especially related to listed salmon and steelhead species where highway retrofits would promote connectivity of tributary habitats to main stem areas and open blocked areas to spawning adults and out‐migrating juveniles. ◾️Resource evaluation strategies and conservation areas identification will follow State Wildlife Action Plan (SWAP) Best Management Practices and the Western Governors Association (WGA) rule sets developed for defining, categorizing, modeling, assessing, aggregating, and categorizing fish and wildlife and habitats of concern, unfragmented lands and connectivity areas, terrestrial game and sportfish, and crucial habitats." ◾️"Wildlife over- passes should be closed to the public and any other human activities and roads should not be on or near wildlife overpasses, as it will hinder wildlife use of the structure (Clevenger and Ford 2010). Overpass structures and fencing will affect our access to the forest. To say that our access would remain the same, and that there is will be no new plan for our forest is a lie. ◾️Maps and figures that have been published in this paper, are maps that the writer generated herself. They cannot be accessed by a general user to the IDFG website. ◾️If you look at the data they are generating, the reports include insects on a windshield in addition to the birds and mice. ◾️This data is being collected and generated by Rene Seidler and Hilary Turner, who are working as contractors within the IDFG. Ms. Turner is credited as helping Ms. Altshuld with her maps. ◾️This data includes unverified carcass reports by anonymous drivers and also sightings of live animals along the road. Yes live animals. They don't have to be an unfortunate roadkill to be counted, the need to calculate higher numbers has added this metric to the data collection. Both of these metrics largely contribute to the high reporting numbers. We all live here. We know there are not 35-60 dead animals a month on our road. ◾️The mobile app that that they are using to do this reporting through was developed by Yellowstone to Yukon and partners, and the IDFG is accepting reporting from any user that has dowloaded it for free. ◾️This data IS NOT found in the regular IDFG roadkill and carcass reporting system. It is data being collected for a private data base which is controlled by internal users. ◾️This data is completely controlled by the data input source, the data analysis technicians operating and sharing it, their data collection method, and the maps are generated by the person or persons who is the data source controller. The final reported information is the responsibility of the end user and a result of the data layers they chose to include. I would like to thank Ms Altshuld, Seidler and Turner for so perfectly illustrating how science can be skewed, manipulated, and co-opted to suit a pre-determined outcome and purpose. Such ‘science’ is not ‘best science’, it is bought and paid for science. Yellowstone to Yukon (Y2Y), the Idaho Fish and Game and local assistants, are the driving force behind the building of overpasses along Hwy 20 in Island Park. They are the driving force that have inserted the plans they desire into a highway project. They are the driving force behind the mis-information in this community and county. The IDFG is lobbying state sportsmen groups to support this agenda, you may have seen some of their organizations listed on a county mailer promoting MORE MEAT, MORE FUR, MORE OPPORTUNITY to be found with wildlife overpasses and behind miles of fencing... Say WTFur? Y2Y organized and created the Island Park Safe Wildlife Passage Initiative on Facebook beginning in June of 2016 and they are paying for ads to push their message on that social media page ahead of this election. Y2Y also advocates in this local election campaign as the Fremont County Citizens for Safe Highways and Safe Highway for Island Park. All three are Y2Y. Y2Y is based in Canmore, Alberta, Canada. Y2Y is a foreign foundation and it’s network has great plans to influence our future and they have been actively lobbying in this election. Do NOT be fooled by the deceptions. Their truth…is their truth…it is NOT THE TRUTH. A yes vote is NOT a vote for safe wildlife passage. Everyone wants safe passage for wildlife and we support common sense solutions to achieve that. A yes vote is a vote FOR Y2Y and IDFG’s overpasses and fencing. On Nov 6th, I encourage you to VOTE NO. How richly ironic it is, that despite all the well laid-paid for-planning they have done to force this down our throats, in the end they were not able to stop our vote and they cannot participate and vote themselves. We have found the one component they cannot manipulate. At last week’s IPPC meeting we had a discussion about the wildlife mortality numbers being reported by the pro-advocacy leaders of the wildlife safe passage campaign. One of our members, after looking at the research I presented, asked a very important question, ‘how do we get this information out to the community and county, they deserve to know that the information they are being given is not correct.’ Here is my best attempt to do that and compress 10 days of research into a simple article. ◾️2012-2016, mile post markers 400-406 (Targhee Pass), over a 4 year period, 17 wildlife involved crash incidences. ◾️The Fremont County Sheriff’s report: 2013-to present, over a 5 year period, mile post markers 400-406 (Targhee Pass), 29 reported instances. Fremont County Commissioner Miller presented this information to the ITD board in the Rigby meeting. Please note that Fremont County has always allowed for a common sense margin of reporting error, these reporting methods will not reflect the absolute number of wildlife deaths for every single animal at 100% accuracy. These are verifiable reporting methods, given that an ITD maintenance crew or contractor removes a dead animal from the roadway-notes the location-and files the paperwork, or that a law enforcement officer investigates an accident/incident, verifies the location, and files the paperwork. This has been the verifiable reporting system that has been accepted over a long period of reporting years throughout our state. Through examining these traditional reporting methods, I cannot produce any data that even compares to the '165 wildlife mortalities of medium to large size animals in Fremont County’ that is being claimed to have occurred over the period of a single year, as stated in multiple public meeting remarks and in opinion articles in this newspaper by proponents for wildlife overpasses and fencing. That 165 number is credited to the research and reporting of Rene Seidler and her associate investigator. So I went there to look. This data was found on the IDFG website, it is 22 pages of uploaded mobile data collection. I looked at every single pronghorn, moose, elk, mule deer, white tail deer report for Fremont County to verify case information and location. I looked into many other wildlife species cases in this report to verify mapping location methods. ◾️230 BIRDS, they include sparrows, blackbirds, grouse, hawks, owls, partridge, chukar, and others. Birds make up the highest percentage of roadkill reports. In addition there are, 28 cases of birds that are also included in this report from other counties. WILDLIFE OVERPASSES DO NOT SERVE BIRD SPECIES AND THE MILES OF ASSOCIATED FENCING ARE A NEGATIVE FOR THEM, AS THEY CAN GET CAUGHT UP OR FLY INTO THE FENCE. ◾️46 SKUNKS, there is 1 other case from Madison County included in this report. WILDLIFE OVERPASSES ARE NOT INTENDED TO SERVE THIS SPECIES. ◾️39 SMALL ANIMALS, rodents, mice, chipmunk, squirrels, rabbit, marmot, all in Fremont County. No reports of these species from other counties are included. WILDLIFE OVERPASSES ARE NOT INTENDED TO SERVE THESE SPECIES. ◾️20 OTHER SMALL ANIMALS, badger, muskrat, mammals? ( unidentified), cottontail, jackrabbit, badger, in addition, 3 of these are reported from other counties in this report. WILDLIFE OVERPASSES ARE NOT INTENDED TO SERVE THESE SPECIES. ◾️10 raccoons, Fremont County, 4 incidents are also included from other counties. WILDLIFE OVERPASSES ARE NOT INTENDED TO SERVE THESE SPECIES. ◾️12 domestic CATS and DOGS, 3 other cases are also included from other counties. WILDLIFE OVERPASSES DO NOT SERVE THESE SPECIES. ◾️13 FOX and COYOTE, 3 cases from other counties. WILDLIFE OVERPASSES ARE NOT INTENDED TO SERVE THESE SPECIES. ◾️7 PORCUPINE. WILDLIFE OVERPASSES ARE NOT INTENDED TO SERVE THESE SPECIES. ◾️3 SNAKES and 2 TURTLES. WILDLIFE OVERPASSES ARE NOT INTENDED TO SERVE THESE SPECIES. ◾️0 PRONGHORN (the recent pronghorn death near Valley View is not included in this report). In addition to this number, 3 other cases from other counties are included in this report. ◾️1 MOOSE, reported far off the road in a gully, badly decomposed and ravens alerted the investigator to the carcass, no evidence to confirm this was a roadkill vs. winter kill, the date is February 2018. ◾️4 ELK were reported, 2 on SH 87, there is 1 suspect case being called an ‘elk' - where only a blood spot could be seen, is was reported by IMNs between the IP city limit and Big Springs, investigated 3 days later where no ‘body’ could be found. 1 ELK, juvenile, found at the Ashton Hill, shot in the neck/.45 shell casing found. ◾️4 WHITE TAIL DEER (1 at Targhee Pass), 1 is a duplicate report, 1 is reported near Rexburg/Sugar City map marker. There are also 13 cases from other counties contained in this report. ◾️33 MULE DEER (1 at Targhee Pass), 13 of these reports are duplicates, a single report is duplicated 12 times. Most of these reports are on, or near the Ashton Hill. It should be noted that, we had a lot of game in the spring observed all along the US 20 roadway. They were attracted to the roadway by the calcium/salt based snow/ice solution that had been used over the winter and, coming off that season of fasting and low calorie/nutrient diet, they were hungry for it. Perhaps, the high incidence of deer roadkill this past season can be contributed to by this single factor? There were also an additional 24 other cases from other counties contained in this report. ◾️ 40 large game numbers (pronghorn, mule deer, white tail deer, and elk) are also reported from other counties. Personally, I can validate 5 elk mortalities in Island Park this summer. 2 near Harriman, 2 near Federal Hill, 1 near Elk Creek. The incident near Harriman, that involved elk being hit by a reckless driver coming around other cars stopped in the road for the elk, is 100% credited to the driver error and reckless behavior of that driver. ITD board commissioner Lee Gagner for Dist 6, strongly pointed that out to Ms Bejerke at the Rigby meeting when she addressed it. None of these elk mortalities appear in this report. Real incidents and real numbers that are absent, can draw skepticism toward the accuracy of the Seidler reporting method. Large to Medium Sized Animals and the much talked about- 165 WVC number. It is very apparent that the ‘medium to large’ size animal definition that is being promoted is absolutely misleading. It is in fact, absolutely false. “Small to medium’ sized animals in this report are specific in each SPECIES. For Example: a jumping mouse ( is small), size comparison then increases to a squirrel (medium sized) and then increases to a marmot (large size). These are small-to-medium-to-large size RODENTS. Or in the case of the birds, a sparrow is smaller than a grouse which is (medium sized) increasing to the size of an an owl or swan (large bird). These are small-to-medium-to-large sized BIRDS. The claim that "165 medium to large sized animals have been killed in Fremont County", DOES NOT define medium to large size UNGULATES, such as pronghorn comparative to moose. UNGULATES are the medium to large size wildlife species that wildlife overpasses and associated fencing are designed for. …so where did the 165 number come from? I tried a math experiment. If you subtract the substantial number of birds, the turtles and snakes, the cats and the dogs, and the duplicate deer-elk numbers = 168. Allowing for a small margin of error, the number you arrive at is 165. Is there a deliberate mis-information campaign being visited upon us? Counting every dead animal can generate high numbers, especially if you take into account the distances of all of the road miles on Hwy 20 in southeastern Idaho. Careful messaging of those numbers can give the impression that a large amount of large game are being hit on our roadways? In the next breath, what has been added to those statistics is an under-reporting argument, but the Seidler data, in fact, does not show that. Only someone generating the data in the first place, or helping to do so, or someone looking hard into it, would ever know or find out this information. Do the people presenting this numbers at public meetings and in newspaper opinions know what Seidler’s wildlife mortality data really illustrates? Our record requested information indicates that the safe wildlife passage campaign and working group members were collaborating closely with the IDFG on this data collection so it can be reasoned that they do. Both Tim Reynolds and Jean Bjerke presented these numbers to the ITD Board in Rigby. Mr Reynolds chastised the ITD Board for not working with the IDFG and admonished them saying ‘ITD and the IDFG are barely even talking to one another’…maybe ITD has figured out that IDFG deserves an arms length? Karen Hiatt of ITD has stated that ITD asked the IDFG to step out of the EA process some months ago, and yet we have learned through our record requested information that the IDFG submitted a report recommending 3 wildlife overpasses at Targhee Pass anyway. Rene Seidler sent that report directly to BioWest, the EA team. So we can assume that the FHWA has that recommendation. Rene Seidler authored that EA report. It is very ironic that the Seidler data ACTUALLY DOES PROVIDE definitive proof that there ARE NOT wildlife mortality totals at Targhee Pass, or any other location along US 20 in Fremont County, that qualifies the purpose or the need for multiple wildlife overpasses and fencing in Island Park. The Seidler data shows 2 dead deer at Targhee Pass, 1 white tail and 1 mule deer, and ZERO ELK June 2016-June 2017. All three reporting methods are consistent when you compare them, and they show we have less than 7-10 ungulates killed at Targhee Pass every year. There are many other high incident roadways in Idaho where that number of animals are hit in a 24-48 hour reporting period, which does not make them any more or less unfortunate a circumstance, but it does offer a valuable perspective. Reprinted with permission by IP News. Prior to the Advisory Vote on wildlife overpasses there is information that is important to understand. This website has numerous articles and other documented information that explains what the wildlife overpass issue is really about, and how our state agencies have been working with groups who do not live in Fremont County. Here are some of the key issues for consideration. Yellowstone to Yukon (Y2Y) has been a driving force behind the building of overpasses along Hwy 20 in Island park. In 2016, Y2Y created the Island Park Safe Wildlife Passage Initiative (IPSWPI), promoting wildlife overpasses to Island Park citizens. Prior to this initiative, from 2010 to 2014, Y2Y participated in Elk and Moose movement studies along Hwy 20 with the Idaho Master Naturalists (IMN) to identify “hotspots” for their movement. Calling this “citizen science”, Y2Y then credited this as citizen involvement. Neither Island Park or Fremont County citizens were notified or included in these studies. Y2Y also participated in the Patricia Cramer studies for placement of wildlife overpasses along Hwy 20. Y2Y has also been an active participant with the Idaho Transportation Department (ITD) in promoting overpasses through their other initiative Henry’s Fork Legacy Project (HFLP). The HFLP members met with ITD in 2016, prior to any ITD announcement of the Hwy 20 Corridor project to Island Park residents. Y2Y specifically targets transportation projects to implement their objectives. This factual information was found in a records release. In addition to Y2Y collaborating with ITD, they have also been doing the same with Idaho Fish & Game (IDFG). Creating a “working group” with IPSWPI group members, an IDFG contract employee also met with them. IDFG specifically hired a road ecologist, Rene Seidler, who was instrumental in creating wildlife overpasses for Pronghorn in Wyoming, and she was the invited employee to the working group. This was also discovered through a records request. The reason Y2Y promotes overpasses is for their connectivity agenda. Y2Y believes that wildlife migration routes should be protected through designated corridors. If a migratory corridor is created it can then be placed under protection status which means the area cannot be used for any type of activity such as development, snowmobiling, OHV use, hunting, or other recreational activities. It would have the same protections similar to a designated wilderness area. With this type of designation, a migration corridor would also serve their objective to use it as “linkage” between other protected areas, in this case linkage to Yellowstone Park. Since Yellowstone is considered a protected area, a migration corridor that starts with a wildlife overpass would then create a potential, protected linkage point from Yellowstone over the Centennial mountains to the Salmon area. Essentially, their goal is to create multiple protected areas from Yellowstone over to the Salmon area, substantially reducing any ability to live in or use those areas. The Y2Y agenda stretches all the way from Yellowstone into the Yukon in Canada. The data and statistics have been significantly misrepresented by Y2Y and embellished for their agenda. Data from ITD and IDFG on wildlife vehicle collisions (WVC) and roadkill have shown this misrepresentation. The actual numbers show few Elk have been killed by WVC along Hwy 20, and none of those have been at the site for the proposed overpass(s) at Targhee Pass. Initially, ITD proposed 17 overpasses throughout Hwy 20 in Island Park but has since been narrowed down to just Targhee Pass because of its connectivity to Yellowstone. Idaho is actually ranked 28th in deer collisions, only 1 in 172 collisions. The Federal Highway Administration (FHA) is the lead agency on this Hwy 20 transportation corridor. By law, the FHA is obligated to Coordinate with local governments on this project. In spite of county officials requesting this Coordination requirement is followed, the FHA as yet has failed to comply. Coordination demands that any federal project “shall” be consistent with local land use policies. Wildlife overpasses are not consistent with Fremont County land use policies or plans. To give the appearance of not promoting wildlife overpasses, Y2Y is now promoting “Vote yes for safe wildlife passage”. This is a deception. Do not be fooled by this deception. A yes vote is NOT a vote for safe wildlife passage. It is a vote for overpasses and fencing. A NO vote means that massive wildlife overpasses and miles of fencing are NOT an acceptable solution to WVCs. All of this information is documented on this website, in articles and under the Library tab. If Y2Y achieves their objective of having wildlife overpasses built, there will be incremental attempts to isolate Island Park from use. All Fremont County citizens will be affected by this. 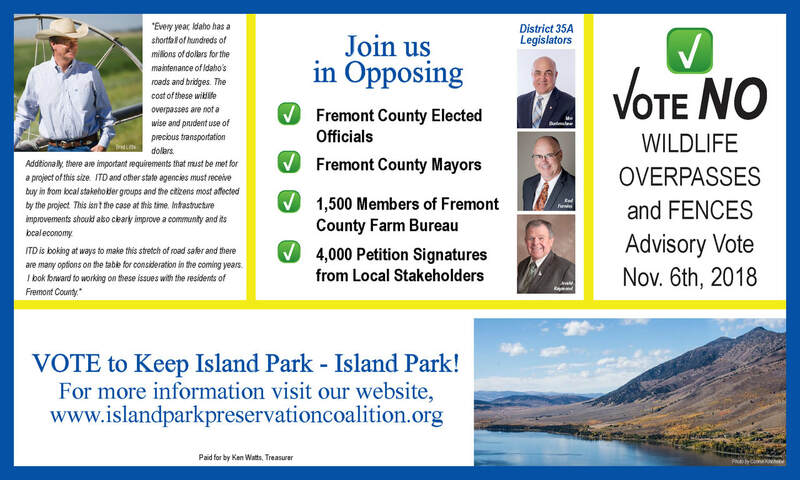 It is imperative that Island Park is represented by local elected officials and not by groups who are not Island Park or Fremont County citizens. Citizens of Fremont County must be vigilant to these attacks and not afford them any opportunity to gain the ability in determining the future of the county. That future belongs to the citizens of Fremont County working closely with their elected officials who welcome advice and consent from their constituencies, which is the purpose of an Advisory Vote initiative in the first place. Please share this post with all Fremont County citizens. “My name is Ken Watts. I am the chairman of the Island Park Preservation Coalition. The Coalition is a grass roots organization made up of Island Park and Fremont County citizens. The vision of the coalition is to preserve and enhance multiple use in the Island Park area. The Coalition’s vision and mission are submitted for the record. As you know, Idaho bridges are rated D and roads C- by the American Society of Civil Engineers. According to ASCE the maintenance backlog for Idaho bridges is $2.2B. The maintenance shortfall for roads is projected to be $3.6B over the next 20 years. The Coalition believes that it is fiscally irresponsible to even consider constructing wildlife overpasses, underpasses and miles of fencing with this liability facing the State of Idaho. Lt. Governor Brad Little agrees. He stated: “Every year, Idaho has a shortfall of hundreds of millions of dollars for the maintenance of Idaho’s roads and bridges. The cost of these wildlife overpasses do not seem like a wise and prudent use of precious transportation dollars.” The ASCE report is submitted for the record. The Island Park Chamber of Commerce, the Fremont County mayors, the Fremont County Commissioners, the District 35 State Representatives and Senator, the Fremont County Farm Bureau, the Big Horn Hills Estates Property Owners Association, and the Coalition oppose wildlife overpasses and fencing in Fremont County. In addition, the Coalition has collected nearly 4000 signatures of people in opposition to wildlife overpasses and fencing. A County advisory vote will be held on November 6, 2018 to assess the sentiment of the voters in Fremont County on this issue. Lt. Governor Brad Little stated: “Additionally, there are important requirements that must be met for a project of this size. ITD and other state agencies must receive buy in from local stakeholder groups and the citizens most affected by the project. This isn’t the case at this time. Infrastructure improvements should also clearly improve a community and its local economy.” There is overwhelming opposition to overpasses and fencing on HWY 20 in Fremont County. The overpasses and fencing may have a negative impact on the recreation economy of Island Park. The risk is unacceptable to the Coalition and the groups previously mentioned. In addition, the Coalition believes that the overpasses and fencing will lead to the desecration of the US20 corridor. This is an environmentally sensitive area. The Targhee Pass area has wet lands and a trout stream immediately adjacent to the highway that could be damaged. It is also part of the Nez Perce Trail, the Trail of Tears, which may contain important historical artifacts. Photos of an overpass, under construction, are submitted for the record. The environmental concerns shown in the photos are obvious. The photos depict overpasses currently under construction East of Wells, Nevada. These overpasses are over two lanes of traffic. At Targhee Pass an overpass would be over three lanes. This will increase the cost by a factor of 3 to 5 based on the higher strength required of the structure, not to mention the seismic zone requirements which have not been discussed. It may not even be possible to transport the massive pre-stressed concrete arches required. A few weeks ago Ken’s Korner revealed that the Idaho Department of Fish and Game (Renee Seidler and Gregg Serveen) were working on a grant to get funding for wildlife overpasses at Targhee Pass, between State Highway 87 and the Montana State line. (STRIKE 1) The Idaho Transportation Department (Karen Hiatt) told IDFG that they would not support this effort because they were in the NEPA process on the Targhee Pass Project and no decision had been made to build overpasses (pre-decisional). This was revealed via emails from a public records request. Why should you care? Because this proves that IDFG was not impartial in their support of wildlife overpasses at Targhee Pass. Just two weeks ago it was revealed that IDFG (Renee Seidler, Gregg Servheen and others) participated on an obscure working group which is promoting wildlife overpasses at Targhee Pass. This group included Y2Y, the Forest Service, the Henry’s Fork Foundation, and private citizens. Again, this was revealed via a public records request to IDFG. (STRIKE 2) Why should you care? Because this proves again that IDFG was not impartial in their recommendations to ITD. The cooperative agreement between ITD and IDFG is for three years and $300,000 of your tax dollars. “The purpose of the cooperative agreement is to use the expertise of IDFG staff to inform and assist ITD project design and support ITD NEPA documents and permitting needed for ITD project development.” This purpose is no longer valid because IDFG has been removed from the environmental assessment process and their input is no longer being considered. Therefore the cooperative agreement should be terminated. Why should you care? Because your tax dollars are being wasted. Ken Watts and I have been quite busy going through recent record requested information that we have received from the IDFG. Ken has told you already about the ‘quiet’ working group that was directed by Kim Trotter of Y2Y. This group calls themselves the Island Park Safe Wildlife Passage Initiative Working Group and they coordinate with the IDFG and other non-governmental groups. You can also find their presence on Facebook and the related groups noted on that page include groups referenced on the list below. We found reference to this group in a comment in the scoping report made by Jean Bjerke. I wish to focus on one document contained in the record requested information we received, and one topic within it. It is a document produced by Kim Trotter US Program Director-Y2Y and Rene Seidler IDFG. It is a document that I have never seen published. It is formatted in two columns, one titled Myth and the other Fact. While it addresses 21 multiple comparative topics, I will focus on just one of them in this article. ITD’s Bill Shaw convened monthly meetings in an effort to update the US 20 corridor plan to the new iPlan software. This planning group consisted of Liz Davy, CTNF Island Park District Ranger, Tom Cluff, Fremont County Planner, and Kathy Rinaldi, representative of the Henry’s Fork Legacy Project. ◾️Please note as you consider: coordination is a government to government process. ◾️Liz Davy does not represent Fremont County, she works for the USFS and IS NOT an elected representative from Fremont County. Liz Davey has NO authority to coordinate for Fremont County and other record requested info indicates she was an active working group participant. ◾️Kathi Rinaldi is also a regional representative of the private NGO -Greater Yellowstone Coalition. The Henry’s Fork Legacy Project no longer exists, it has been removed from the web, and was never more than a front organization for the safe wildlife passage working group and it’s collaborating partners which included the USFS, the BLM, the Henry’s Fork Foundation, Yellowstone to Yukon, the Greater Yellowstone Coalition, Future West, and the IDFG. Kathi Rinaldi has NO authority to coordinate for Fremont County, other record requested info indicates she was an active working group participant. ◾️Tom Cluff is an employee of Fremont County and his position is unelected. Other than having his name appearing, associated by the reference made to him by these two individuals, he is not included in any other meeting documentation we have received. Tom Cluff is the Fremont County planner, he has NO AUTHORITY to coordinate for Fremont County. Keep in mind that this is Trotter and Seidler developing this document, and as they are attempting to do so, apparently trying to rebut opposition points being made throughout these many months of public dialogue on the issue, were they trying to claim that Cluff was the contact in Fremont County, along with Davy and Rinaldi, and that coordination that had never happened somehow did through these people? One thing is for certain: None of these entities or persons have the authority to coordinate about anything for Fremont County. In many public opportunities and meetings the Fremont County Commissioners have definitively stated that COORDINATION DID NOT HAPPEN with Fremont County, as is required by multiple federal laws. Ken has also pointed out in his previous article that Trotter and Seidler also developed the talking points that were given to some Island Park residents, many of which were presented when they appeared before the county commissioners asking them not to hold an advisory vote on this issue. It appears that Trotter and Seidler have fulfilled many orchestration roles, and disclosure about this private working group speaks to some of their efforts. Trotter directed this group, and it should also be noted that dates coincide with her cancellation of all future meetings of it, right after inquiry was made about it. This blog will help you make sense out of all the information on the website, how it affects IP, previous articles in the IP News, our history, and how efforts continue to put IP into various forms of conservation status.